TV viewing levels did decline right after the digital switch on June 12, but have since returned to previous levels, according The Nielsen Company. According to TV research company blog postings, the decline in viewing was largely temporary; in recent weeks, it has seen audiences returning, as more homes have added converters. Nielsen credited significant public awareness campaigns that ended with only 2.2% of television households unready for digital television when the June 12 transition hit. That's not to say there aren't problems. Nielsen notes that as of June 28, 60% of completely unready homes -- about 1.7 million -- are able to view some television by watching a low-power station, a foreign station near the Canadian or Mexican borders or a U.S. broadcast station that is available to them via a "translator." According to Nielsen, that means television viewing in these homes has not disappeared completely, although viewing choices are extremely limited. The iPhone is increasingly going global. That's a key finding in the latest monthly metrics report from mobile ad network AdMob. An analysis by the company found that 54% of iPhone and iPod touch users worldwide in June were in the U.S., down from 61% in January. This signals that international adoption has picked up since then, although the U.S. still has by far the biggest proportion of users of any country. The iphone is changing the industry and revolutionizing peoples access to internet. Mobile media and mobile adverting has become stronger as the iphone became more popular. Competitors must create methods for easier internet browsing to compete witht the iphone. This generates a good platform for the mobile advertising industry. A study, recently released by WorkPlace Media, outlines some of the hurdles facing major brands as they attempt to harness the worlds of Facebook, Twitter and MySpace, to create an impact with consumers.The study, which polled office Internet users, found that 55% maintained at least one social networking account. However, of those respondents, only 43% reported accessing their social networking accounts at work, and even for those with access, 78% reported spending less than 30 minutes per day on their site(s). Here is some extensive research on Social media. The article suggests that Social media may not be as important to marketing as people think. The overall impact of a brand's presence on social networking sites was shown to be minimal in terms of impact and perception. Since social media may be new to digital marketing it is hard to say what works and what doesn`t work. This data is hard to take as fact without knowing how the data was retrieved. The power of social media needs more time to manifest in the advertising world. Perhaps because it's still a relatively new field, interactive marketers seriously lack confidence in their ability to measure the relative effectiveness of social media campaigns, according to a new study by Forrester Research. Of 119 interactive marketers asked between May and June to rank such measurement capabilities on a scale of 1 to 10 -- 1 being novice and 10 being expert -- the average response was 4.5. "We find this average ambitious considering that social media is still less than four years old," said Emily Riley, Forrester Research analyst and author of the report. I find that Social Media is too early to claim social media as a stable in digital marketing. However I do think it is a current trend to capitalize on. Myspace, Twitter and facebook will all run its course as new mediums appear. Mobile connection may be the new frontier but it is always effective to ride the wave and speculate. The difficulty in social media, contrary to frequent discussion, isn’t in how to use the tools or the tactics. It’s not about measurement or determining ROI. Those things are tangible, and solvable, with time, dedication, and elbow grease. Here is a site that rates hashtags frequency. 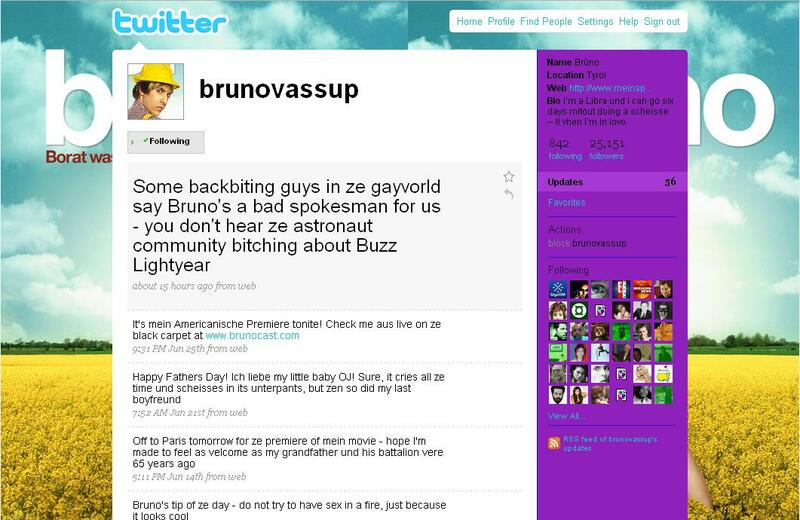 Bruno, The docu-comedy about a flamboyant gay teenager interacting with real Americans, may have suffered from a unique instant rating capability by users of twitter. With Twitter we can instantly find out what the public thinks is hot or cold. Bruno reviews by Ebert may become insignificant to the millions of views by everyday people. Twitter is consistently showing its power. READ ABOUT IT IN TIME.